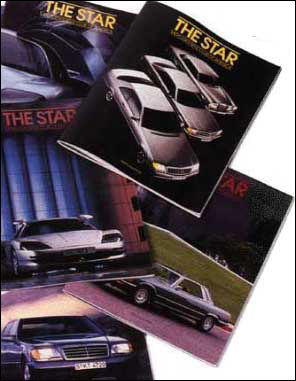 The award-winning four-color magazine, The Star, is the Mercedes-Benz Club's bi-monthly national publication. Available only to members, a subscription is included in the annual family membership dues. Usually over 120 pages in size, each issue brings you technical information, an historic feature car in color, the latest news from Mercedes-Benz, articles on restoration, club events, new car road tests and a wide variety of advertisements from those providing products and services for your car. Typical articles include Vision SLA Unveiled (at the Detroit Auto Show), salon features on the 1929 Mercedes-Benz Type S Roadster and a 1973 450SLC, and hints on the care and feeding of your automobile climate control. The Star also covers past and present Mercedes-Benz racing, MBCA events, new models and a broad range of technical articles. Our goal is to enhance your enjoyment of your Mercedes-Benz, new or old.